Generally, Outlook users encounter various issues from time to time. Duplicate items are one such common issue which may lead to severe problems. In this article, we’ll find out the common reasons for duplicate emails in Outlook and how to prevent them. Also, we’ll learn how to remove duplicates from the Outlook PST files in the most effortless way possible. Duplicate emails in Outlook can surely affect the performance and productivity of mailbox. Also, it may cause error messages sometimes. All the messages stored on the server get reloaded whenever Outlook starts. This action can affect the performance of the computer system. Having duplicate emails in Outlook increases the size of the PST file. Keep in mind that PST file has a definite size limit. And whenever it reaches or crosses the size limitation, it becomes highly prone to corruption. Duplicate items can be a major problem for those users who have to deal with numerous email messages every day and reply to each message. Have you ever noticed duplicate emails in Outlook mailbox? You must be wondering where they’ve come from or how they’ve generated. In the Outlook mailbox, a duplicate item can be anything like an email, contact, calendar, task, note, etc. Many times Outlook users complain about the duplicate items in the mailbox, especially the emails. Suppose you look in your Inbox folder, and you find it filled with duplicates upon duplicates of email messages, i.e. all having the same subject, timestamp, etc. Ain’t it annoying? The situation of having duplicate emails in Outlook can cause a real nuisance at times. You have to search or diagnose the real source of the duplicate items. Then you need to find a fix for it. And finally, you need to clean up your Inbox. Or you can simply leave the duplicate items just like that, and get on with work. But keep in mind that those duplicate items will take up space in the Outlook mailbox. And one day, the Outlook data file will reach its maximum size or maybe cross it. This will definitely slow down the Outlook client and degrade the performance. And sometimes it may lead to more complex issues like corruption. Outlook users might also be interested in How to Deal with an Oversized PST File? Rule 1: Move emails from contact A to folder B. Rule 2: Move emails containing xyz in the subject line to folder C.
Let’s suppose you receive an email from contact A that contains xyz in the subject line. Consequently, due to the rules, you get the same email in both B and C folders. You need to resolve this issue by changing the rules appropriately. Reason #2: Suppose something goes wrong after you synchronize your Outlook profile with any other application or device. And due to this, the last batch of emails is present twice on your computer. In order to fix this issue, you need to delete the duplicates manually from the mailbox. Reason #3: Maybe an email is corrupt on the server, and thus a duplicate is generated when Outlook starts the Send/Receive operation. You need to fix this issue by logging into the email server and deleting the corrupt email that’s creating the duplicates. Reason #4: Outlook generates duplicates on each Send/Receive operation if the “Leave a copy of the messages on the server” box is checked on your account settings. In order to fix this issue, you can simply uncheck this option under Account Settings > More Settings > Advanced. Reason #5: If you subscribe to a mailing list multiple times, you’re likely to have duplicate emails in Outlook mailbox. You can simply unsubscribe this service or contact the person that sends you the same emails again and again. How to Remove Duplicate Items? You must delete or remove duplicate items so that you can prevent severe issues. 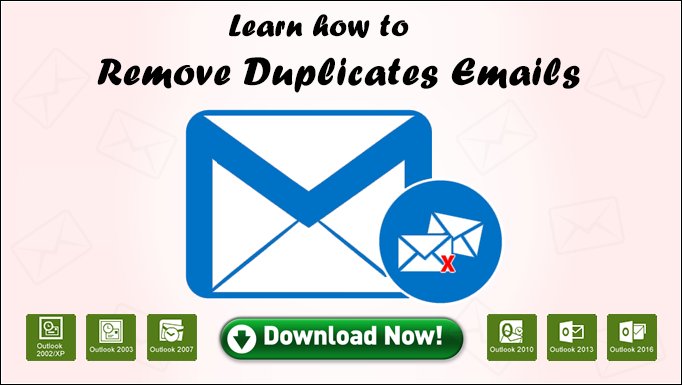 Generally, there are two ways to remove duplicate emails and other items: either manually or by using a professional solution. In the manual method, you need to select the duplicate entries and delete them in the Outlook manually. If you have a large number of duplicate items in the Outlook mailbox, it’s a matter of deep concern. Deleting or removing them manually will definitely involve a lot of time and effort. In such a situation, you should use a professional solution to make this task easy and effortless. The Outlook Duplicate Remover provided by Shoviv Software is an award-winning solution to remove duplicate items from Outlook PST files. It’s a powerful utility that can search the duplicate emails in Outlook and successfully remove them to make Outlook more productive. Additionally, this software can remove duplicate items from contacts, notes, tasks, journal, and calendar items in the Outlook mailbox. Being a safe solution, it only removes the duplicate items. It doesn’t cause any alteration to the original PST files and keeps them intact. Instead, it creates new PST files and saves all the mailbox data excluding the duplicate items. Shoviv Outlook Duplicate Remover tool can supports both ANSI and Unicode PST files created by all major versions of Microsoft Outlook including the latest 2016. For free evaluation purpose, the software is available with the demo version. You can download the free demo version before purchasing the software. By using the demo version, you can save first 25 email items from each mailbox folder of the selected PST files into new PST files. Duplicate emails in Outlook are one of the most common issues faced by Outlook users. It not only affects the Outlook performance and productivity but also the mailbox functionality. Therefore, it’s really important to remove duplicate items by using a solution recommended by professionals. In this article, we’ve discussed the harmful effects of duplicate emails in Outlook. Also, we’ve discussed the most common reasons for duplicate items and their fixes. Keep in mind that duplicate items are unnecessary. There’s no need to keep them in the Outlook mailbox. Use the smart Outlook Duplicate Remover tool to remove duplicate items from PST files.